France is on the verge of Revolution! The area of modern France is inhabited by warlike Celtic tribes. The area of modern France is now dominated by the Celtic La Tene culture. 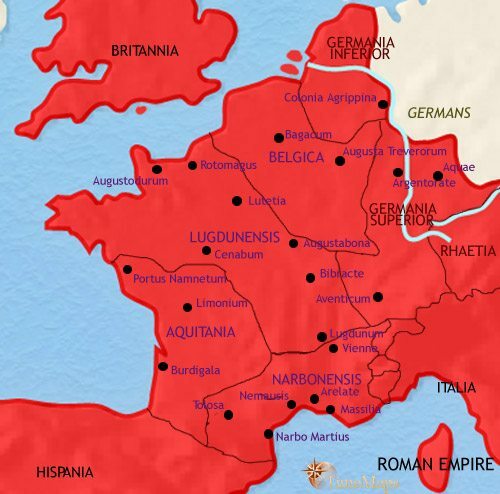 The whole of the area of modern France has been conquered by the Romans. Roman civilization has become deeply entrenched throughout the area of modern France. Gaul is now divided amongst German-ruled kingdoms, but much of the old Roman civilization endures. 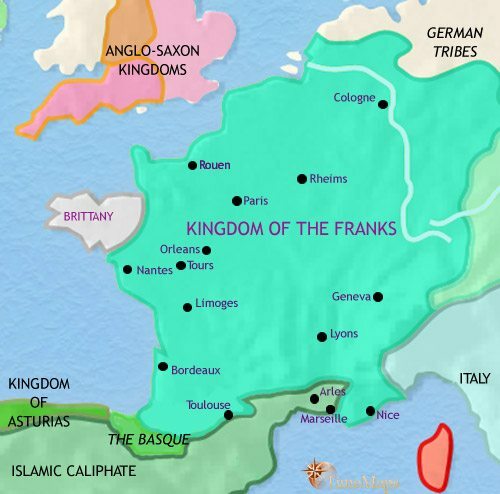 The Kingdom of the Franks now covers all of the old Roman region of Gaul. Internal disorder and Viking raids have brought chaos to the land of the west Franks, as royal authority declines and the power of local lords rises. Several able kings have gradually expanded royal authority within France, at the expense of the regional lords. The kingdom of France has emerged victorious from the 100 Years War. 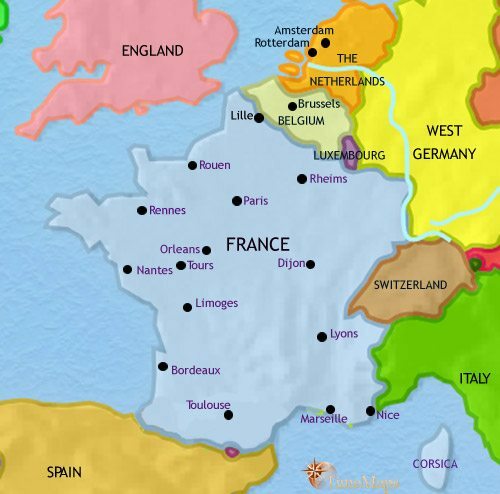 The kingdom of France is now ruled by a highly centralized monarchy. The French Revolution, and then the rule of Napoleon, have changed France for good. France has been defeated in a war with Prussia. France has a huge overseas empire. France has experienced the full brunt of two world wars. France is a leading member of the EU. After Cardinal Mazarin’s death in 1661, the young king Louis XIV took personal control of the government. He oversaw a mass of military and administrative reforms to give him a higher degree of control over the state than any of his predecessors. He built the great palace at Versailles, where his huge court could be housed in appropriate splendour. Louis removed a potential source of resistance to his rule by revoking the Edict of Nantes (1685), causing hundreds of thousands of French Protestants (Huguenots) to flee abroad. Louis attempted to establish France’s frontiers at the Rhine. In this he failed, but he positioned France as the leading nation in Europe. This was the case in culture as well as politics, and throughout the 18th century leading French intellectuals such as Voltaire (1694-1778), Diderot (1713-84) and Rousseau (1712-78), have greatly influenced European thinking on all sorts of subjects. Indeed the Age of Enlightenment (as this period would later be labelled) has profoundly shaped Western world views right up to the present day. Louis XIV’s successors have been less successful in maintaining France’s dominant political position, particularly in relation to Britain, with which she has fought a series of expensive and unsuccessful wars. These have contributed to the chronic financial problems which have forced king Louis XVI to call the Estates-General. The French Revolution breaks out this year (1789), as a direct result of these developments. This will sweep away the Ancient Regime centred on the monarchy of Louis XIV and his family. 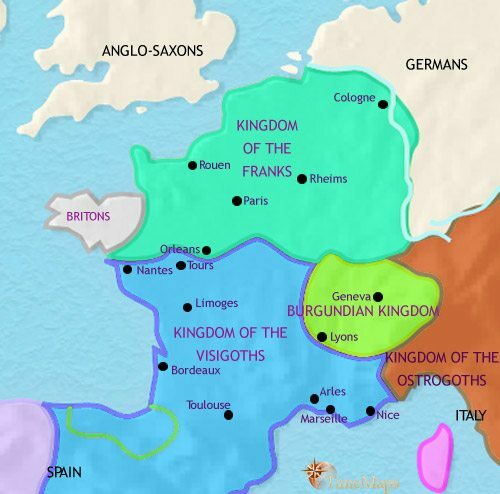 The past few centuries in Western Europe (from around 800 BCE) have seen the spread of Celtic peoples across France and into Britain, Ireland and Spain. The Celts have brought with them an Iron Age culture, a society dominated by aristocratic warriors, and their characteristic hill forts around which large settlements cluster. Powerful chiefdoms have emerged in the region. They have also brought with them a thirst for luxury goods. This demand is fed by imported goods from the Mediterranean as well as by domestic manufacture – the Celts make beautiful jewellery. This trade is enhanced by the presence of Greek and Carthaginian colonies on the southern coasts of France and Spain. From around 450 BCE, Celts of the late Iron Age La Tene culture expanded outwards from their homeland in Switzerland and Austria; into France – where they became known to history as the Gauls – and on into Britain, Spain and northern Italy. A group of them raided as far as Rome in 390 BCE, sacking the city. The La Tene Celts benefit from a wide network of trade, and their material culture has come under heavy influence from the Mediterranean civilizations, mainly Etruscan and Greek. Celtic craftsmen make elaborate jewellery, notably neck bracelets, called torcs. This period sees the growth of large settlements – called oppida (towns) by the Romans – built around stout forts. 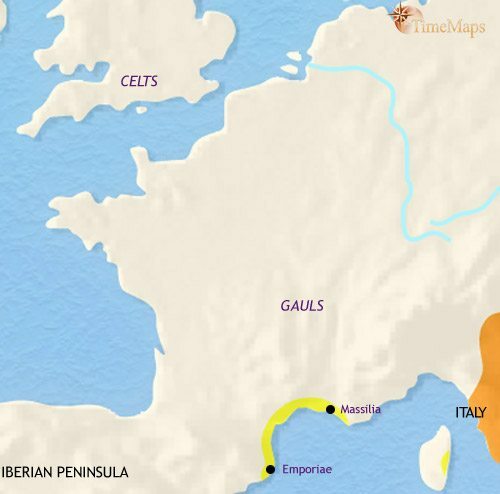 By 120 BCE the Romans had conquered the Rhone valley and Mediterranean coast of Gaul, planting colonies there and introducing the Roman way of life to the inhabitants. 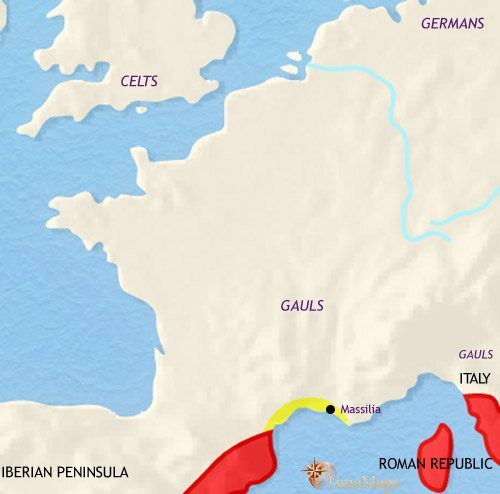 The rest of Gaul remained divided amongst large and powerful Gallic tribes, and in the north east, by Belgic tribes of mixed Gallic-German origin. The whole of Gaul was conquered by the Roman general Julius Caesar in a long drawn-out campaign between 58 and 50 BCE. Having pacified the region Caesar formed the old Gallic tribes into self-governing communities, under their native aristocracies. Augustus divided Gaul into four provinces. Of these, Narbonensis is well advanced in terms of Romanization, having been under Roman control for over one hundred years. Romanization is beginning to gather pace in the rest of Gaul. A network of roads has been built, and Italian merchants are busy integrating the region more closely into the Mediterranean trading system. Lugudunum (modern Lyons) is the leading city in the new provinces, and has a large number of Roman merchants settled there. Because of its historic status as a religious centre amongst the Gauls, it helps to radiate Roman influence over a wide area. The provinces of Gaul have experienced more than two centuries of almost unbroken peace. During that time Romanization has penetrated deeply into the way of life of the inhabitants. Prosperous cities dot the land, and Roman citizenship is widely spread amongst the population. Indeed, the province of Narbonensis is regarded as a virtual extension of Italy, and several of its leading families can be found in the Roman senatorial order. In the rest of Gaul the old Gallic aristocracy continues to hold sway, but now as Romanized estate owners and urban magistrates. 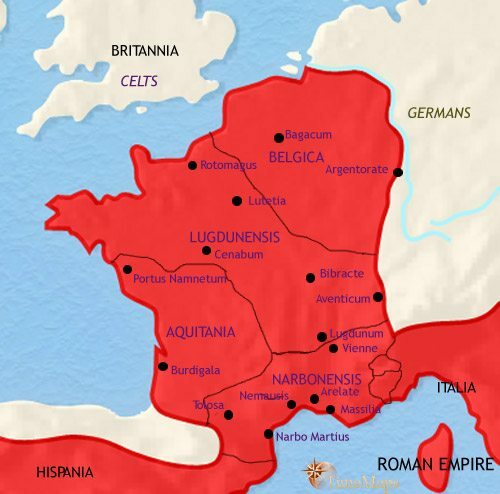 Roman rule in Gaul has now completely collapsed, after a long decline. In the 5th century, German tribes invaded in force, and established kingdoms which, by the end of the century, covered almost the whole of Gaul. The one exception to this is the the north-west, where Britons, fleeing Anglo-Saxon invaders in their homeland, have settled. The old Roman towns, aqueducts, villas and roads have experienced great damage, but much of Roman civilization remains. The new German rulers have taken over many government practices and laws from the Romans, and employ Gallo-Roman officials to help them rule. By the time of the fall of the Roman empire, Christianity had become the official religion. The German invaders were also Christians, but followed a different form of Christianity, Arianism. The Gallo-Roman population, who are Catholic Christians acknowledging the Bishop of Rome (the Pope) as their spiritual leader, view this with suspicion. This religious divide prevents conquerors and conquered from settling down easily together in these kingdoms. 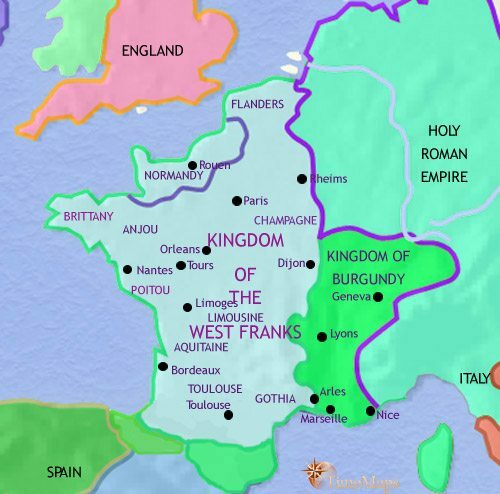 The Franks, however, have converted to Catholicism, and this will greatly assist them in expanding their realm during the years to come. One of the German tribes established in Gaul by the end of the fifth century, the Franks, expanded their realm greatly under Clovis and his successors, to cover most of modern-day France and much of western Germany. Internally, however, the realm was increasingly divided amongst different princes, whose rivalries sapped their power. Eventually, Clovis’ descendants were reduced to being mere figureheads, dominated by powerful officials called the Mayors of the Palace. One of these officials, Charles Martel (the Hammer), reunited the Frankish lands and repulsed a powerful Muslim raid from Spain in 732 at Tours. He died in 741, and his son, Pepin the Short, who has succeeded him as Mayor of the Palace, will depose the last of the old line of kings in 751 and have himself elected king by the Frankish nobles. Since Clovis’ day, the Franks have been loyal champions of the Catholic Church. The Church enjoys enthusiastic royal patronage, and the Frankish lands are covered by a well-established church organization, firmly loyal to the popes in Rome. Because it largely monopolizes literacy and learning, the Church is invaluable in helping administer the realm, and also in bringing stability and organization to newly conquered territories. Pepin the Short’s son, Charles the Great – Charlemagne (768-814) – waged ceaseless campaigns against the peoples on his borders, and built up a large empire in Europe. He worked tirelessly to establish both sound administration and the firm establishment of the Christian Church (often the same thing, given that royal administrators were usually clerics) within his realm. The line of Charlemagne died out in 987, and the nobles elected Hugh Capet, count of Paris, to the throne. Hugh’s authority, however, was severely limited. In the chaos of the 10th century the regional counts had become virtually independent princes within their own territories. For all their weakness, the position of the early French kings was recognised and sanctified by the Church, and in a religious age this gave them a prestige not enjoyed by any other prince or lord. This enabled Hugh and his successors to gradually build up their power within their kingdom. Recent decades have been testing times for royal authority. One of the king of France’s vassals, the count of Anjou, inherited a huge stretch of land in France, and in 1158 even became king of England (Henry II, reigned 1158-89). Fortunately for France, she has one of her most able kings sitting on the throne, Philip Augustus (1180-1223). Taking advantage of the mistakes of king John, Henry II’s son, he has seized most of John’s French possessions, and brought them under tight royal control. This has greatly strengthened royal power in relation to the regional princes in the rest of France, and the king’s authority on the south is being further increased by a successful royal crusade being waged there against a heretical religious sect called the Albigensians (1208-13, 1223-6). Many unresolved claims and counter-claims between the French and English kings led to war between them lasting, on and off, for more than one hundred years. There were major English victories, at Sluys (1340), Crecy (1346) and Agincourt (1415), but recently the French have driven the English back, until by this date (1453), they only have Calais left to them. The most remarkable aspect of this French triumph is the leading part played by a young French peasant girl, Joan of Arc. The struggle with the English was greatly complicated by the emergence of a new state on the French flank. 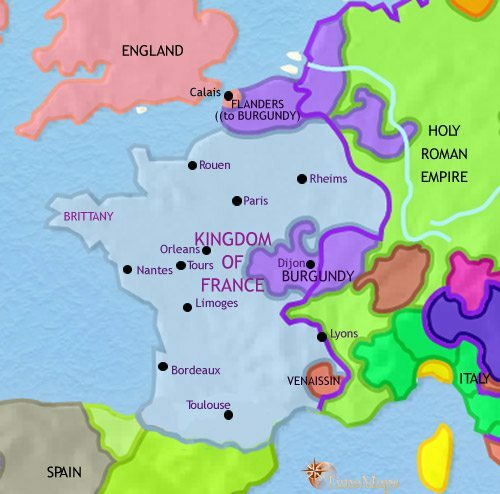 The duchy of Burgundy started as a fief granted to a French prince, and has grown through inheritance and conquest to become a major player in European politics. It now controls most of the Netherlands and Flanders – amongst the wealthiest areas of Europe – as well as its original Burgundian territories. 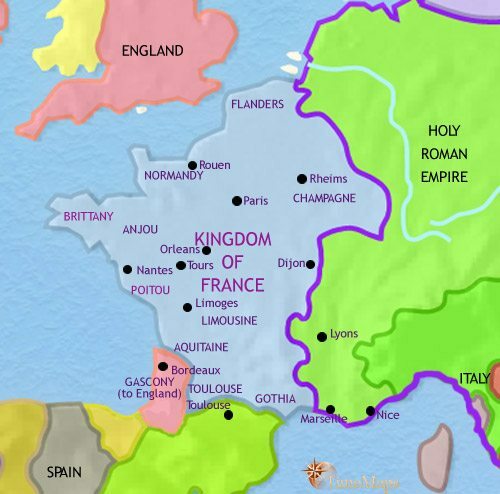 Victory in the 100 Years War has greatly strengthened royal power within France. Another factor bolstering the French kings’ authority has been their close relationship with the papacy. Indeed, between 1309 and 1377 a succession of popes actually based themselves in France because Rome had become too unruly for them. 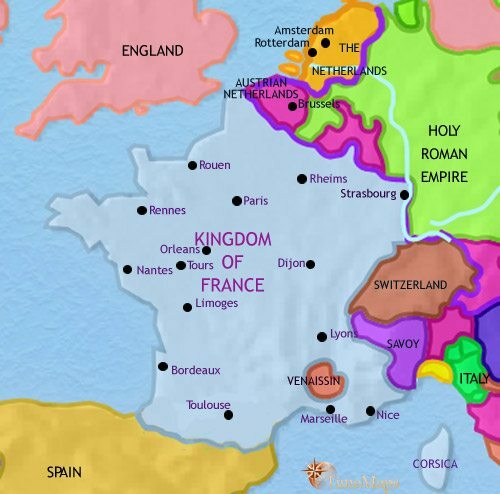 The popes lived in an enclave within France called the Venaissin, which was, and remains, papal territory. 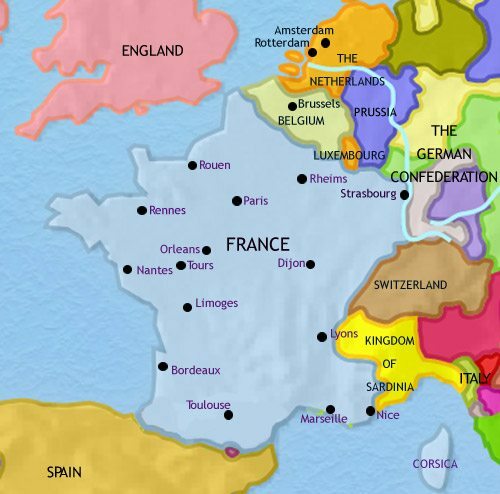 After the expulsion of the English from most of France, the country was united under a strong monarchy, and then greatly expanded its territory. The powerful duchy of Burgundy suddenly ceased to exist when it was shared between the French and Hapsburg monarchs after the death of its duke in 1477, and Provence was willed to the king of France in 1486. Brittany was added in 1491. France was then heavily involved in a long and bitter struggle with the Hapsburgs (1494-1559). The bulk of this fighting took place in Italy. In the 16th century, Protestant teachings spread fast amongst all levels of French society. The Protestants were called Huguenots. France was racked by religious civil war during the second half of the 16th century, as the Huguenot and Catholic factions struggled for control. This was ended only when Henry, king of Navarre, succeeded as king of France in 1589, and, although leader of the Protestants, converted to Catholicism. He issued the Edict of Nantes in 1598, recognizing Huguenot religious freedom in the territory they already occupied. Since then, ministers such as the duke de Sully and Cardinals Richelieu and Mazari have strengthened royal administration, and France has become the wealthiest and most populous nation in Europe. Her involvement in the 30 Years War (1618-48) has further increased her power. However, the highly oppressive taxation this has involved has led to a serious revolt, the Fronde, which has not been suppressed by this date (1648). Once the forces of Revolution had been unleashed, in 1789, the situation rapidly deteriorated until a period of “Terror” followed (1793-4), as the Revolutionaries executed thousands of real and supposed enemies, including the king and queen. This aroused the hostility of the rest of Europe, and they found themselves at war with the other leading powers, Prussia, Austria and Britain. The French, however, found in Napoleon Bonaparte one of the most brilliant generals in history, who won great victories and then, by means of a coup, gained the leadership of the French state. He transformed French institutions with an astonishing series of measures touching every aspect of public life and, in 1804, made himself Emperor. Napoleon’s wars lasted on and off until 1815, engulfing the entire continent. Brilliant generalship brought him great success, but gradually all the major powers of Europe allied themselves against him and he was finally and decisively defeated at the battle of Waterloo. The victorious powers now set about trying to restore a European order based, as far as possible, on the situation before the French Revolution. 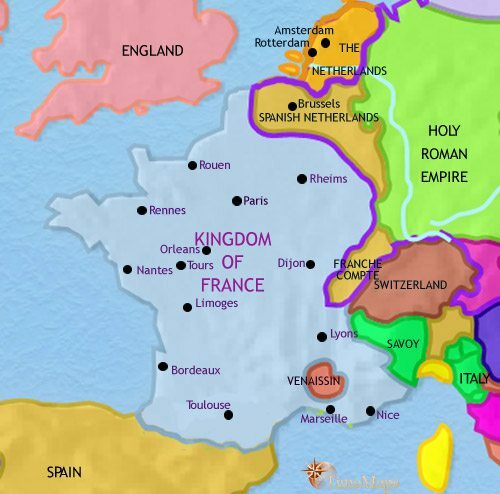 The Bourbon monarchy again ruled France; however, it was not the same country as before. A measure of parliamentary democracy was maintained, the old nobility and the Church had lost their privileged place in society and state, and the land was now in the hands of the peasant farmers. Anger at efforts to restore absolutism under the last Bourbon king Charles X (1824-1830), led to the enthronement of the liberal Louis Philippe, the “Citizen King”, who has governed the country since. King Louis Philippe’s attempts to stem more liberal forces led to the Revolution of 1848. This resulted in the setting up of the Second Republic, under the presidency of Napoleon’s nephew, Louis Napoleon Bonaparte. Following a similar pattern to the previous Revolutionary Republic, this also gave way to an Emperor Napoleon, Napoleon III (from 1851). After years of mounting tension with Prussia, and fearing her growing power, Napoleon III declared war in 1870. There followed, for France, the disastrous military defeat at Sedan and the siege of Paris, which has finally ended in January of this year (1871). France has lost Alsace-Lorraine to the new German Empire, and the war has been followed immediately by the uprising of the Paris Commune, which is only crushed, by a French army, after bitter street fighting. 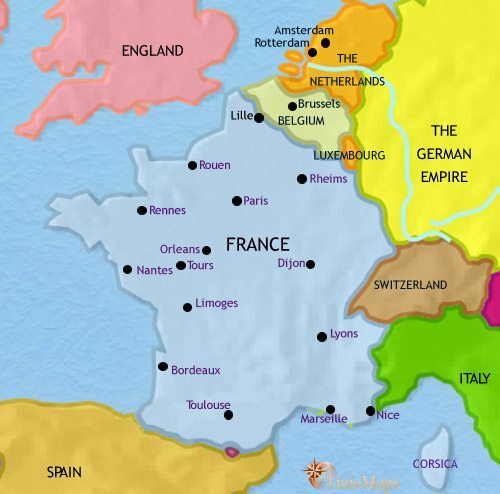 Since 1871, France has been governed by the parliamentary democracy of the Third Republic. This has been characterized by a succession of weak, short-lived administrations, but it has presided over a period of unprecedented economic expansion and a brilliant cultural flowering. This can be seen most notably in the works of Impressionist painters and sculptors such as Monet, Renoir, Cezanne, Rodin and a host of others. Overseas, France has acquired a huge empire in West Africa, South East Asia and the Pacific Ocean. France sustained terrible losses in World War 1, but in victory she regained Alsace-Lorraine, and forced punitive reparations from Germany. World War 2 saw France being occupied by Germany; but Free French forces, built up by Charles de Gaulle in the French overseas territories, played a notable part in her liberation. France then experienced strong economic growth under the Fourth Republic, but the credibility of the government was undermined by a series of weak, short-lived governments. France’s place in the world was further damaged by a series of fierce colonial wars, above all in Indo-China and Algeria. As a result, in 1958 the Fourth Republic was replaced by the Fifth Republic. In order to avoid the weak governments of the past, this has given the President a central role with extensive powers. The first of these presidents is General de Gaulle. He actively seeks to find constructive solutions to France’s colonial problems, which will result in her withdrawal from all her major overseas posessions. France is a founder-member of NATO, and a founder-member of the European Common Market. France is now governed by the Fifth Republic. This has seen much greater political stability than previous regimes, and has also seen great economic expansion. France has withdrawn from most of her overseas empire, and has focussed on her role as a leading member of the EU. Medieval Europe is beginning to emerge from the wreckage of the Ancient World. Muslim forces from North Africa have conquered most of present-day Spain and Portugal.